Can Palacio fill Henry's boots? "He won't marry... Play away?" PLUCKY teenager Chris Stewart is one of just five people in the world to survive a virtual decapitation – and the only one who has EVER walked again. And even more incredibly, the 13-year-old, who suffered his horrific injury in a motor racing accident, recovered in just five months — with the help of Spice Girls hits. 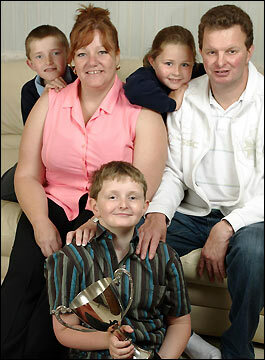 The Stewart family’s nightmare began one day last September when they were enjoying their favourite pastime. Mum Debbie recalls: “Chris was a big fan of motor racing and had been doing it for about two years. He raced a 1,000cc Mini which has been specially modified. There are no windows or dashboard, it is basically a shell. “Racing was his passion and it was a real family event for us. Me and my partner used to go with his two sons, and Chris’s dad came and helped him with any repairs that needed to be done. As they watched Chris speed round the track, the family shouted with excitement as he took the lead on the final lap. But suddenly the youngster lost control and his car ploughed into the corrugated iron surrounding the track at 35mph. Debbie, from Fareham, Hants, recalls: “With my heart thumping I reached the car seconds after my ex-husband and could see my lovely boy slumped over the wheel. “The sight will never leave me – it was horrifying. He was unconscious and there was blood coming from his mouth. “Seconds later, two paramedics from the St John Ambulance were there and they acted straight away. 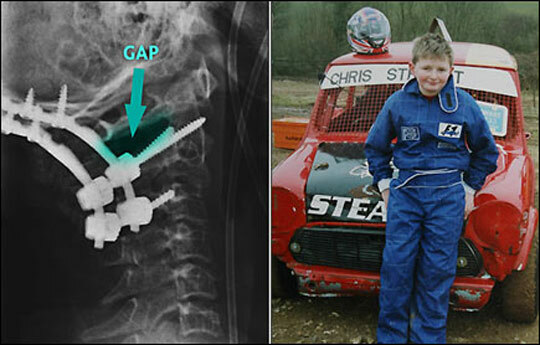 “Chris was coming round slightly and the paramedic had to get into the back of the race car and secure my son’s neck. “He held Chris’s neck for an hour and a half — if it had moved within three millimetres of this position he would have certainly been left paralysed. “I was told to get on to the car bonnet and keep Chris talking. I had tears in my eyes but I had to keep him positive. “Throughout all of this the firemen were cutting Chris out of the car, while a man from the track was lying beneath it to stabilise it, putting his own life at risk to get him out. “After 90 minutes Chris was free, and a flying doctor had him strapped to a spinal board within seconds. “At the hospital the doctor took me to one side and said Chris had received terrible injuries in the crash including a broken shoulder. 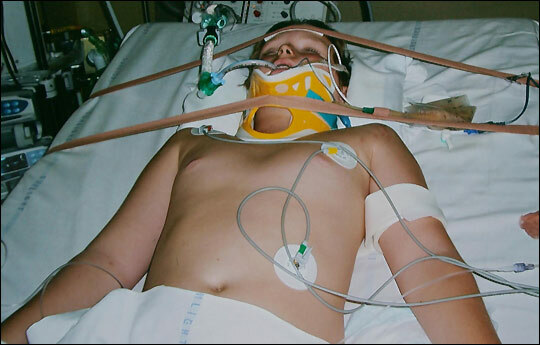 “He told me Chris had severed every bone and ligament in his neck. “He had almost been decapitated and all that was holding his head to his shoulders was his skin. “This was such a distressing image that I burst into tears. I started imagining what his life would be like if he survived. Would he be paralysed? Would he be severely disabled? Debbie remembers the first time she saw Chris in hospital: “Entering the intensive care unit was the hardest thing I have ever had to do. Seeing my little boy hooked up to machines was dreadful. The operation was a pioneering procedure in which cartilage was taken from Chris’s hip and grafted on to his neck to bind his head to his body. The op took six hours, 90 minutes of which involved painstakingly moving him from lying his back to his front. This was the most dangerous part of the operation because if the spinal cord was twisted it could kill him instantly. Debbie says: “Afterwards the doctor told us Chris had pulled through. I couldn’t stop the tears of joy. I felt blessed. The doctor told me he had never seen such an extreme injury that wasn’t on the mortician’s slab. After the surgery Chris was taken off sedation but was still ventilated. As he opened his eyes his mum told him to blink if he knew who she was. A gruelling schedule of more than 100 hours of physiotherapy was needed to make sure Chris regained his co-ordination and movement. Debbie says: “The exercises were really tough and his poor body had been through so much that he didn’t want to get out of his hospital bed. “We used to have to play the Spice Girls to get him up and about. “Chris’s injuries were so terrible that the neck muscles had stretched and the muscles in his eyes had lost all tone, which left his eyes crossed and his vision blurred. “With work by the physiotherapists on his face muscles the tone came back and his eyesight returned to normal very quickly. Rather than focus on what he cannot do, Chris remains positive about the future. Although motor sports are off the agenda for ever, driving will not be a problem. And despite a total of five months of missed time at Neville Lovett School, determined Chris is still top of the class in all his subjects. Debbie admits: “Going back to school was a very big deal for me, bigger than it was for Chris. I just wanted to be able to keep him safe. 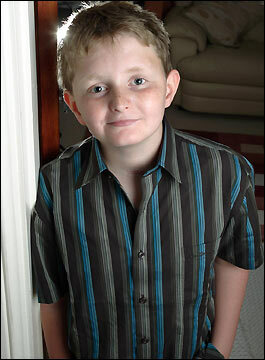 “Last week was the first time that he went to school on his bike with his mates. I can’t describe how proud that makes me. What an amazing young man and phenominal recovery.